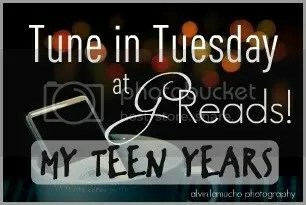 1997-1998 [Tune in Tuesday] – my books. my life. Check out the other Tune in Tuesday posts over at GReads! (This was – clearly – the year when my hair really started to get out of control. It wasn’t until mid-way through my senior year that I discovered the miracle that is the flatiron. I promise, I don’t leave the house like this anymore.). What were you listening to in 9th grade? Hahaha my hair was out of control, too. I would let it AIR DRY. Oh the horror. NSync was definitely on heavy rotation in my teen years. I loved boy bands, but I was a bit past the “teen” years when they really became big. I remember going to see BSB when I was 18 with my older sisters! haha Oh goodness we looked out of place. The sad thing is that I probably did blow dry my hair there. And it still looked that awful. I thought a round brush was all I needed. I wasn’t in my teens when boybands like NSync and BSB were big, but I loved them all the same! I was never really that big an Usher fan though, not until he released his Confessions album. I was little when I started listening to NSync but I was obsessed. Same with Usher. I don’t know the first time I heard If You Could Only See but love that song. 9th grade: 1967-1968 The US was embroiled in the VietNam war and all of the anti-war protests. Rock music reflected that – the protests, that is. Also, I grew up in southwestern Ontario and our music was greatly influenced by Motown. Love that you included a picture too! I saw NSYNC on that tour. And possibly a few other – cough 4 cough – times. Usher! How funny you should add this song as I just posted on another blog about love triangles. I loved N’Sync and Usher. To this day, anytime someone says “it’s 7 o’clock” (which seems to happen sort of often, I pretty much instinctively start singing “on the dot, I’m in my drop top cruising the streets…” on and on until I’ve sung the whole song, LOL! Pingback: TSS: July 2012 Recap | my books. my life. Appriaection for this information is over 9000-thank you!